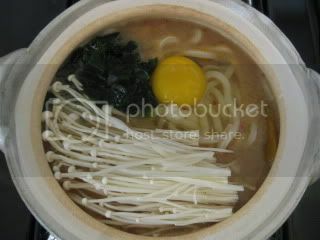 Mini-size donabe is great for making single-serving one-pot lunch, too. 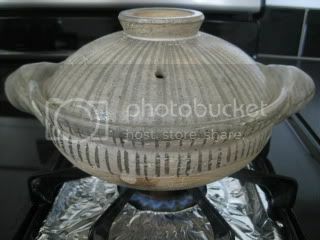 Here's my mini Rikyu-Tokusa donabe. 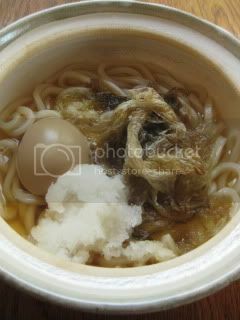 Nikomi udon, with grated daikon and tororo kombu (shaved vinegar-marinated dry kombu), and soy-marinated boiled egg. 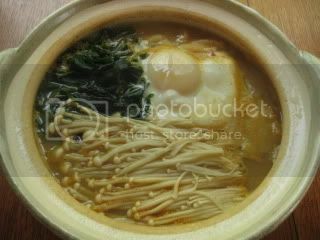 On another day, I did udon with miso & kochujang (Korean hot bean paste) broth and runny-yolk dropped egg plus tons of wakame seaweed and enoki mushrooms.